Have the system create scheduled Invoices. Have the invoices automatically send to the customer when generated if you want. If using a integrated Payment Gateway and a Saved CC, have the invoice automatically charge the customer. Associate to a Contract and have a ticket generate to remind you of the Contract expiring. Automatically clear PrePay Hours so they do not stack up month to month. Can keep track of Assets a customer has and charge based on that. You currently cannot clone Recurring Invoices. You cannot send a Recurring Invoice before it is generated. You can create Recurring Invoices by heading to Admin > Invoices > Recurring Invoices. Next you can create a new Recurring Invoice template or choose from existing templates to make changes. 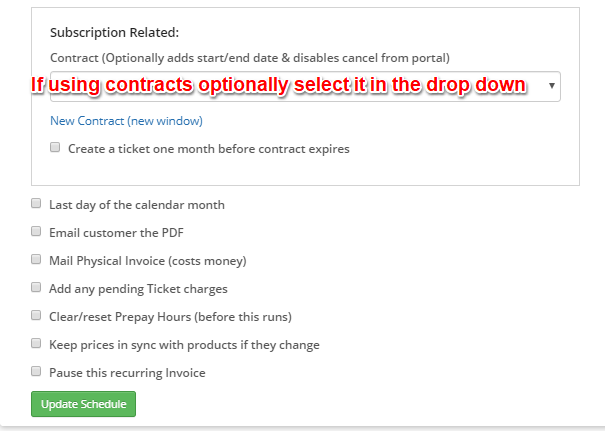 To create a new Recurring Invoice, from the Recurring screen, click New Recurring Invoice (pictured above). Then search the for the customer/business you want to create the invoice template for. Click Proceed and you will be taken to the Recurring Invoice Template screen where all the fun is. Name: A name for the template is required. This is usually the name of the business, but feel free to use whatever convention you want. Employee (for commission): This is a drop down where you can select from your techs to give them Commission credit for the invoice. Frequency: How often the invoice generates. This is a required field to create the template. Period mode: There are two options: In Arrears and In Advance. Choosing In Arrears means that you are collecting for past work that has already been completed, whereas In Advance means that you are collecting funds for work that will be done in the future. Essentially, In Arrears translates to a billing period that is "the last 30 days" and In Advance translates to a billing period that is "the next 30 days". Required. Invoice Billing Terms: If you are using Billing Terms (hopefully you are) you can select them here. Run Next At: This is the next generation date for the invoice and is required for the template. (Optionally) Create a ticket one month before contract expires for a reminder. Email customer the PDF: This will automatically email the customer when the invoice is generated. Add any pending Ticket charges: This will scrape up any pending charges on a ticket and collect them on a single invoice for you. Clear/reset Prepay Hours (before this runs): This resets any left over PrePay Hours so they do not roll over. Keep prices in sync with products if they change: This will make the template automatically update product prices upon invoice creation. Pause this recurring Invoice: This will pause the Recurring Invoice from doing anything. After making your selections, click create Create Schedule. (Don't worry you can come back to make changes later). You will then be taken to the create Recurring Template. Once the template is created, you will be able to add line items. Scroll down to the Line Items section of the template and select the line item type you want. Standard Line Item: This is a product from your Inventory like Labor or a physical good you sell each time the invoice is generated. Asset/RMM Counter: This line will check for the active Assets the customer has of a particular type of your choosing. It will update the line quantity automatically upon generation. Kabuto Package: This will bill your customer for the Kabuto subscription they are signed up for. See Recur for more info on this. Once you have selected the Line Items you want on the invoice, they will be collected and listed on the template like this. If you are using a Data Back Up line, there will be a CloudBerry section below the line items that details the CloudBerry package info. The Change History will show changes made to the Template with time stamps and the User account making the changes. It will also list any time the invoice generates. The Invoice history will list and link to any invoices that have been generated by this template. You can identify if a invoice is a Recurring Invoice by a circular icon showing on the Invoice Tab screen or the Customer Detail Screen. You can also get to a customer's Recurring Templates by clicking on the "Show Recurring Templates" button from the Invoice section of the Customer Detail page. It is possible to create a Recurring Invoice Template from a already created (non Recurring Invoice). To do this head to the invoice you want to reoccur and click Actions > Make Recurring.